There’s a delightful scene in Thomas Hardy’s nineteenth century novel, Far from the madding crowd, the funniest one in the entire novel, where some of the farm workers sitting in the pub get to discussing religion, just as Joseph Poorgrass is meant to be delivering Fanny’s coffin to the cemetery. The ‘chapel-goers’ they talk about are perhaps Methodists or Baptists; I need to look up the language. “Chapelfolk be more hand-in-glove with them above than we,” said Joseph, thoughtfully. In my journey out of fundamentalism over the last ten years, I started off being angry at it. I wanted to argue with every fundamentalist, to show them why they were wrong. Then I went through a period of morbid fascination and I started scrapbooks of outlandish examples of fundamentalist literature (pamphlets, tracts, posters) that I called ‘Volume 1: Live footage from hell’ and ‘Volume 2: Tribulation squad’. In recent years, I’ve just left fundamentalism alone. Most fundamentalists are nice people, and I’m unlikely to help them much by telling them they’re wrong. (And so many mix some fundamentalist beliefs with lots of non-fundamentalist ones.) 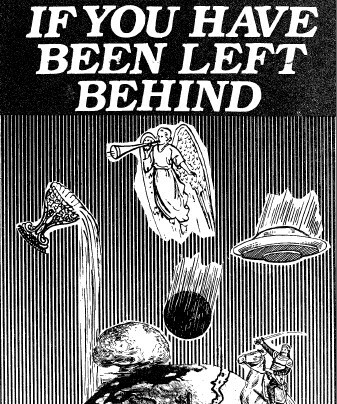 But still, sometimes something comes along that recaptures my old fascination – like this tract I found called ‘If you have been left behind’. Long before the insipid novels, this was the real deal. It’s scarier than the novels, because it is published in all seriousness as a guide to the unbelievers who are left behind when the rapture happens. It may be that this message will sit on many a book-shelf, until perplexed and grief-stricken people come across it. Some may remember the title, and search it out. My reader, if you have been left behind, and realize the Great Tribulation has begun, DON’T TAKE YOUR OWN LIFE, whatever you do! The tract carries on with helpful advice about the sort of things the reader will discover as they face the seven years of tribulation. It’s written sincerely, with the best of intentions. Fundamentalism makes me feel bad about being a Christian sometimes, and I think it will continue to fascinate me and repel me at the same time. In Christian Century magazine, I came across an extract from Kathleen Norris’s new book, Acedia and me : a marriage, monks and a writer’s life. I had to look up acedia. It means spiritual sloth. I was a bratty kid who didn’t want to make her bed. “Why bother?” I would ask my mother in a witheringly superior tone. “I’ll just have to unmake it again at night.” To me, the act was stupid repetition; to my mother, it was a meaningful expression of hospitality to oneself, and a humble acknowledgement of our creaturely need to make and remake our daily environments. “You will feel better,” she said, “if you come home to an orderly room.” She was far wiser than I, but I didn’t comprehend that for many years. I have now made my bed two days in a row. And I intend to follow this through, this symptom of a deeper malaise. The book… is an impassioned protest against fellow believers who, out of acute anxiety to protect God’s sovereignty, are all-too ready to see the hand of God behind the horrors of human history and the disasters of the natural world. For Hart, the greatest, and indeed the only, comfort a Christian can find in the death of a child is the knowledge that in the tragedy one sees, not the face of God, but the face of God’s enemy, whose ultimate defeat is assured. Some interesting things in the new issue of On the Road, the journal of the Anabaptist Association of Australia and New Zealand. It is no use rediscovering any of our church’s roots, nor discerning innovative ways to be faithful to our church’s calling, if we won’t slow down, stay longer even if we can’t stay put indefinitely, and stake something like a vow of stability. Slow down – because postmodernism may be hypermodernism. Stay longer – because there is no way to discern God’s will together without commitment to sit long together in the first place. A vow of stability – because it is no use discerning appropriate ways to be Christian disciples in our age if we do not embody them through time, testing, and the patience with one another that our good ideas and great ideals need, in order to prove their worth as communal practices. I have pretty much swallowed the contemporary myth that freedom is the failure to make deep connections or commitments to a place. I’ve moved about thirteen times in the ten years of my adult life.